Over the past 15 years I have spent thousands of dollars testing and experimenting different products, services, books, healing tools and other resources to improve my health and life. Below is a collection of the most effective products I've tested personally that have had a positive impact on my health and life. No matter what area of your health or life you’re trying to improve, this page will save you the time, money and headache of having to research and test products yourself by introducing you to the most effective tools for the job. Often called “immune milk” or “first milk”, colostrum is the first meal of all mammals in nature. 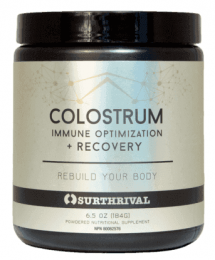 Colostrum is extremely rich in immune antibodies, immune transfer factors and growth factors. Consuming colostrum is THE way that all mammalian mothers pass on their immunity onto their newborn young. The growth factors in colostrum stimulate the maturation of the newborns digestive system which allows for full nutrient absorption and prevents food allergies. Scientific research has shown that bovine colostrum transfers the same benefits to humans as calves. This page contains affiliate links, meaning when you purchase through one of them, I will receive a commission. This won’t cost you anything extra and it will help support EndAllDisease. I recommend these products because they have helped me and I hope they can help you too! Please don’t spend any money on these products unless you feel they will help you on your journey towards health.